That's it for the live text of this round of Championship matches. We hope you've had as much fun reading it as we have writing it. We'll leave you with a picture of the 2014 County Championship champions, Yorkshire. defeat Surrey at New Road. Chasing 217 to win, Surrey looked well set on 131-2, but the visitors collapsed to 189 all out as their promotion hopes were dashed. who passed away at the age of 53 in June. So, where do we stand at the end of a round of fixtures which has displayed everything wonderful about county cricket? new county champions in Yorkshire, thanks to an inspired performance against Nottinghamshire from the evergreen left-arm seamer Ryan Sidebottom, who finished with match figures of 9-65. But this title has not just been won at Trent Bridge, performances throughout the year from Adam Lyth, Adil Rashid and the like have given Yorkshire, in my opinion, a very much deserved first title since 2001. BBC Sussex's Adrian Harms at Hove: "It was eventually a comfortable win for Sussex, who cruised to victory with 12 overs to spare. "Craig Cachopa finished 78 not out and, with half centuries for Ed Joyce and Chris Nash, Sussex were always control of the run chase. "Credit should be given to Lancashire, who never gave up, but their future in Division One is now out of their hands." That defeat leaves Lancashire staring at relegation back to Division Two after just one season in the top flight. Glen Chapple's side will now have to hope Middlesex are beaten by Somerset at Taunton next week, before what could prove to be a relegation decider between the Red Rose and the Lord's outfit at Old Trafford in the final round of games. What a match that could be. No name: 50 today, and celebrating in the heart of Lancashire! Well done Yorkshire! Freddie, Wentworth: Well done WCCC on gaining promotion after a great season. Good luck next season. And it's all over at Hove, Craig Cachopa pulls a ball from Luke Procter behind the wicketkeeper for four as Sussex beat Lancashire by seven wickets. Cachopa, who made an unbeaten 78, and Luke Wright embrace in the middle of the pitch as Sussex ensure their place in Division One for another season. BBC Radio Leicester's Richard Rae at Bristol: "There are days when county cricket really doesn't do itself any favours, and this was most definitely one of those days. "With both sides at the bottom of Division Two, there was nothing for either to lose, and on a flat wicket Leicestershire made it clear they'd attempt to chase any target. Unfortunately Gloucestershire captain Alex Gidman - playing his last game for the county at Nevil Road - and head coach John Bracewell appeared to think it more important to be sure of avoiding defeat than giving themselves a good chance to win. "The result was that what could have been a hugely exciting and interesting final couple of sessions turned into a meaningless exercise in giving Will Gidman a chance to go to a century in his own final innings for the county in Bristol. "There are still plenty of positives for Leicestershire to take from the game - centuries for Greg Smith, Ned Eckersley and Niall O'Brien, Angus Robson passing 1,000 first class runs for the season and some seriously quick bowling from Atif Sheikh, including his maiden first-class hat-trick. They will take that confidence into the final two games. That first Championship win for two seasons still remains on the cards." BBC Radio Gloucestershire's Bob Hunt at Bristol: "What began as a promising final day, with Leicestershire bowling much better and having Gloucestershire in a bit of trouble, petered out into disappointment as the home side failed to offer even the smallest of carrots. "It was a shame for the paying public, but what it did mean was that both Alex and Will Gidman registered centuries in their final match at Bristol before moving on to pastures new." Captain Andrew Gale was unable to lift the Championship trophy after receiving a two-match ban from the ECB. Luke Wright comes in and duly hits Steven Croft for six from only his second ball. It's only a matter of time before the game at Hove is over. BBC Sport's Chris Osborne: Hmmm. If Essex are to get promoted, they will have to do it without Ryan ten Doeschate. He has opted to join Kolkata Knight Riders in Champions League. Worcestershire Academy director and former batsman Damian D'Oliveira passed away in June this year after battling cancer. Ed Joyce's innings is over. The Irishman tried to sweep Steven Croft but the ball gets through to the stumps, bringing to an end an entertaining 79 off 80 balls. In the grand scheme of things, this wicket may not have much of an impact, with Sussex only needing 44 runs with seven wickets left. And that's a fifth first-class fifty of the summer for Craig Cachopa, who, don't forget, was playing club cricket not so long ago. He comes down the wicket to Simon Kerrigan and hits it high over long-off for six. The Red Rose are now wilting as Sussex reach 202-2, needing 49 runs to win. Ed Joyce whacks another six off Simon Kerrigan. He and Craig Cachopa really are motoring towards the target. Massive appeal from Lancashire captain Glen Chapple as Craig Cachopa flicks one into the hands of the fielder, but the umpire says the ball did not hit the New Zealander on the glove and he survives. Sussex 170-2, needing 81 to win. Sussex's Ed Joyce is finding the same form as he had in the first innings, and passes his fifty with a six off Simon Kerrigan. Joyce and Craig Cachopa are now finding the boundary with regularity, as Lancashire set a bold field in a bid to force a victory. Sussex now need 90 runs for a victory that would put Lancashire deep in the relegation muck off 24 overs, with eight wickets in hand. Jack Shantry scored his maiden first-class century batting at number nine in the win over Surrey. And a sneaky appearance from director of cricket Steve Rhodes in this selfie! And there it is. Alex Gidman has declared the Gloucestershire innings at 306-9 straight after his brother's century against Leicestershire and the sides shake hands on a match that could have ended more dramatically had the home captain been more adventurous with his declaration. The waiting goes on for Leicestershire, who are still looking for their first Championship win since September 2012. Shantry's haul of 10 wickets in the match against Surrey secured Worcestershire's promotion to Division One. In the fading Bristol sunlight, Gloucestershire's Will Gidman gets his third Championship ton of summer from 122 balls, including 15 fours and two sixes. He has also gone past 800 Championship runs for the season in this innings, to go with his 39 wickets. Surely there will be a declaration from Will's brother Alex soon, and the Nevil Road fans will be put out of their misery. The opener's father passed away from cancer in May 2011. Steady does it now at Hove. Craig Cachopa, who was playing club cricket at Reigate earlier this summer, and Ed Joyce are happy to pick up the singles here and trundle along towards their victory target. Sussex 135-2, needing 116 runs for the win. South Africa-born New Zealander Craig Cachopa, who also holds a Portuguese passport, has settled in very nicely alongside Ed Joyce, moving on to 19 as his Sussex side are 126-2, needing 125 for victory against Lancashire. Who has more passports - Cachopa or Nottinghamshire's Riki Wessels? BBC London 94.9's Mark Church: "Surrey will wonder in the cold light of day how they managed to end up losing this game. "Seemingly in control of their run chase at 122-2 at lunch, they collapsed to 189 all out, with Zafar Ansari the last man to go for a valiant 64. "Jack Shantry's golden game continued as he took four wickets after the interval and all credit to Worcestershire who secure promotion. "For Surrey, their hopes of promotion have now disappeared and they will concentrate on trying to finish the season in a positive manner against Derbyshire on Monday." Read Ged Scott's match report from New Road. BBC Newcastle's Martin Emmerson: "Durham's last win at Lord's in a Championship match was in 1998. Until today, that remained the only one. "Back then, they just reached their target of 240 with a wicket to spare. This time it was far more comfortable, with victory looking certain within the first half-hour of the day as Chris Rushworth took three wickets. "By lunch, Middlesex were seven down and it was a case of when, rather than if, for Durham. The Blaydon Races rang out from the visitors' dressing room at the close, in stark contrast to three weeks ago when they lost at Lancashire and ended up in the relegation zone. "What price the same song on this ground a week tomorrow when Durham play Warwickshire in the One-Day Cup final?" Read the match report from Lord's. Cale Ingram: Congratulations @worcsccc! Picked the wrong week to be away from New Road! Spanish cider to celebrate. Dominic: So happy we are back in Division 1, hopefully our youthful squad can push on and bring the glory days back to New Road. Stefan Ward: @WCCC_Pears back in the top division where we belong! We'll stay up in D1 next year. Use #bbccricket on Twitter, email tms@bbc.co.uk or text 81111 with your name and message. BBC Sussex's Adrian Harms at Hove: Just as Sussex look to be cruising to victory, Kerrigan has Nash caught behind for 57. Is there a sting in the tail? The Sussex middle order has on occasions been a little fragile this season. Just memorise the scene for those winter nights ahead - this is the last day's cricket at Hove this season. Another one down at Nevil Road. Leicestershire's Dan Redfern has followed up his snaring of Craig Miles before tea with the wicket of Liam Norwell, edging behind for just one. Exactly what Lancashire needed. Chris Nash, after reaching 57, feathers one-time England Test spinner Simon Kerrigan through to wicketkeeper Jos Buttler. Nash's partnership of 76 with Ed Joyce has taken Sussex ever-closer to victory though, needing 149 runs with eight left to bat. They're also back out at Nevil Road, where Gloucestershire are eight wickets down after losing Craig Miles just before tea, caught by Leicestershire's Josh Cobb off the bowling of Dan Redfern for 10. Even with that, this game is beyond a result now, and they are just playing for time. It has been quite a day hasn't it? Starting off with Yorkshire lifting the Division One title at Trent Bridge just over an hour into the final day's play, Warwickshire moving into second place with a win over Northants, Durham all but securing top-flight safety and Worcestershire gaining promotion to Division One. And it's not over yet... We're back out at Hove with Chris Nash hitting Simon Kerrigan for four from the first ball of the evening session. Adrian Harms: "Last cake of the season at Hove - can @SussexCCC celebrate with a win? Full commentary @BBCSussexSport." Secretly fuming. We like cake. We want cake. "Lancashire are going to need some post-tea inspiration if they're to climb out of the relegation zone today. "Nine wickets required in the final session, Sussex have made an excellent start to their second innings. "Chasing 251 from 59 overs for victory, the home side are 94-1 with 40 overs remaining in the days play. "Defeat for the Red Rose will leave them 12 points adrift of Middlesex, who have a game in hand." Thanks, Phil, hope you enjoyed that. Go and get yourself a well deserved rest and cuppa. Yes, I'm back and will be with you until we get a result at Hove between Sussex and Lancashire. The hosts really are going some in a bid to ensure their Division One safety for another year, with Chris Nash and Ed Joyce looking in sensational form. It seems like Sussex are slight favourites at Hove, and could push for victory if Chris Nash and Ed Joyce stay at the crease. Yorkshire won the Division One title, a Lancashire defeat - coupled with the prospect of them slipping closer to relegation - would make it a perfect few hours for you if the colour of your rose is white rather than red. Phil Shepka - over to you. BBC Sussex's Adrian Harms at Hove: "Sussex are making good progress at Hove. They are 94-1, needing 157 to win in another 40 overs. "Chris Nash has reached his second half century of the match and with skipper Ed Joyce on 28, Sussex look on course for a win that would secure their Division One status for next season. "Lancashire are being hampered by the loss of Tom Smith, who is unable to bowl because of a back problem." Worcestershire fans - how does it feel to be back in the top division? Who have been the key men this season? And can you compete in Division One next year? #bbccricket on Twitter, email tms@bbc.co.uk or text 81111 with your name and message. bencillo: "Congratulations @WorcsCCC on promotion! Nail-biting finish to the match." Postman_LFC: "Congrats to @WorcsCCC on promotion to Div One. Fantastic season with young players." Jack Apperley: "Huge congratulations to @worcsccc for gaining promotion to the first division! Fantastic exciting cricket!" There are still two Championship matches ongoing - Sussex are 89-1 chasing 251 to beat Lancashire at Hove, while Gloucestershire are batting (still) against Leicestershire as that game at Bristol heads for a draw. As for Surrey, their hopes of going up are all but over. Hampshire need one point from their final two games to eliminate them from the promotion race, so it should be a straight fight between Hampshire and Essex for the second slot. Worcestershire are not Division Two champions yet, but a win over Essex in their final match of the season should do the trick. A bizarre end to the match at New Road - Worcestershire clinch promotion to the top flight after two years in the second tier. In trying to keep the strike, Surrey opener Zafar Ansari is run out by Alexei Kervezee for 64, although there is a massive amount of confusion before the umpire raises the finger. Congratulations Worcestershire and also Jack Shantry, who finishes with 10 wickets and a maiden first-class century to boot. The margin of victory is 27 runs. How are your nerves, Worcestershire fans? Just 28 runs needed for Surrey now, and of course just one more wicket required for the hosts. Jade Dernbach has hit Moeen Ali for a very nice boundary down the ground and is eight not out. I am reliably informed that Jack Shantry is the first player to take 10 wickets and score a century from number nine or lower in a first-class match. One to tell your friends tonight. Meanwhile, Moeen Ali has dropped Zafar Ansari off his own bowling. Will that prove costly? Surrey 179-9, still 38 to win. BBC London 94.9's Kevin Hand: Durham fully deserved their win and, having won four of first six this year, Middlesex may face relegation unless they find another victory in their last two. BBC Sport's Isabelle Duncan at Hove: "Ed Joyce has been smashed on the helmet by Jimmy Anderson. Debris on the pitch! Jimmy means business." Sussex are 51-1, needing another 200 runs for victory. Slow hand claps from Glos members - not surprised. Ludicrous caution from @gloscricket cap Alex Gidman. So much for the public. Almost time to start the celebrations at New Road, where Worcestershire need one more wicket to win promotion. This match has been all about Jack Shantry, who now has 10 wickets in the match to add to his maiden first-class century. Jade Dernbach is the last man in, alongside opener Zafar Ansari, who is still there on 63 not out. Surrey need 38 more runs to win. 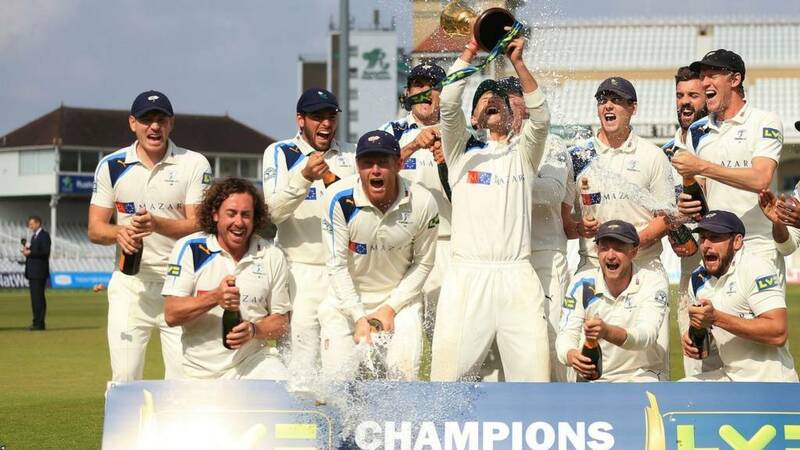 If you are joining us late, the main news of the day is that Yorkshire are county champions, following a massive win over Nottinghamshire at Trent Bridge. cruised to an innings victory. Victory for Durham at Middlesex. And with that, the 2013 champions are almost safe for another year. John Hastings' final act for Durham this summer was to have Tim Murtagh caught for 34 by Peter Chase, as the hosts were bowled out for 254 to give the visitors a 141-run victory. It all but secures Durham's safety in Division One for another season - if Lancashire draw this afternoon, Durham will require just three points in their match against Northants next week to ensure survival. Surrey were 131-2 about an hour ago, but they have collapsed horribly against a rampant Worcestershire, who need two more wickets to win promotion from Division Two. Jack Shantry was celebrating a maiden first-class century yesterday evening and now he has dismissed Stuart Meaker for four to take his ninth wicket of the match. Surrey have stemmed the flow of wickets for the time being, but they are not making much progress towards their victory target of 217 against Worcestershire. They have added just five runs in the seven overs since Gareth Batty fell to Moeen Ali. Live ball-by-ball commentary from BBC local radio continues via the Live Coverage tab. That wicket will give Lancashire hope. They desperately need a win over Sussex at Hove to maintain any chance of retaining their Division One status, and who else but James Anderson with the breakthrough? Luke Wells edges a nasty rising ball to Steven Croft at second slip and Sussex, chasing a target of 251 to win, are 26-1. Tom Smith is out for 38, with spinner Jigar Naik taking his first wicket of the innings. They might as well shake hands for a draw there now, to be honest, with the hosts extending their lead to more than 300. BBC Radio Northampton: David Willey will miss @NorthantsCCC game at Durham next week through shoulder and back injuries. Ben Stokes bowls Ollie Rayner for 38 and moves Durham within one wicket for victory against Middlesex at Lord's. It is a first wicket of the innings for Stokes, taken with a stunning ball that nipped back in, hit low on middle stump and sent it cartwheeling. BBC Radio Northampton's Chris Egerton: "An 11th defeat in 14 for Northants, at the end of a punishing week for the bottom club in Division One. "But perhaps the younger batsmen in the squad can take inspiration from the composed and ruthless manner in which Sam Hain and Jonathan Trott picked apart Northants' bowling attack to win this game. "One meagre crumb of comfort is that Adam Rossington, James Kettleborough and the in-form Ben Duckett - who played excellently for his second fifty of the game - top the batting averages for the season. All three are aged under 22." Read the match report from Edgbaston here. If you were hoping for an unlikely win for Leicestershire against Gloucestershire at Bristol, that prospect appears to have gone. After losing a wicket just after lunch, the hosts have steadied things somewhat and are 213-6, leading by 294 runs. Do Sussex fancy chasing 251 to beat Lancashire at Hove? They are 16-0 after four overs. James Anderson and Simon Kerrigan are sure to be key to Lancashire's chances, especially with Tom Smith struggling with a back problem. "We believe that we have played some really strong cricket this year and the lads deserve it. We were ruthless. "It's one of the best moments in my career. I had some great times in my playing career and really enjoyed it and now this is the peak of my coaching career. It's a fantastic feeling." Read more reaction from the Yorkshire camp. The beard that is feared keeps taking Surrey wickets. Is Moeen Ali bowling Worcestershire into Division One? England all-rounder Moeen has bowled Gareth Batty for 16 and the visitors are 164-7, still needing 53 runs to win. It has been some turnaround since lunch and the hosts are surely now on top. BBC Sport's Isabelle Duncan at Hove: "Sussex need 251 to win - game on. Jimmy [Anderson] needs to be tip top and Simon Kerrigan will give it some rip." BBC Sport's Ged Scott at New Road: "Opener Zafar Ansari reaches his third fifty in four innings against Worcestershire, but this one must be his slowest, coming in the 57th over of the innings. Surrey are 159-6 and need 58 to win." Durham would all but secure their Division One status with a win at Lord's, and leave Middlesex still sweating on their top-flight place for 2015. Much will depend on whether Lancashire can beat Sussex at Hove, although the Red Rose have played a game more than their closest rivals. We began the day wondering if Middlesex could repeat their mammoth run chase against Yorkshire earlier in the season. The answer appears to be no. The hosts are 200-8 and still 196 runs shy of their victory target. Toby Roland-Jones is out 26, caught by Phil Mustard off the bowling of Peter Chase. Two more wickets needed for Durham, deposed as champions by Yorkshire a couple of hours ago. A win for Worcestershire will be enough for the Division Two leaders to clinch promotion with a game to spare. Third-placed Essex would be unable to catch them. BBC Sport's Ged Scott at New Road: "Aneesh Kapil plays back to a low one from Moeen Ali and is bowled. Still 73 to win - Worcestershire probably now favourites on a worn pitch that is clearly starting to play a few tricks." Jonny Bairstow: ‏100th first class game, CHAMPIONS 2014, special day with a special club!! YORKSHIRE AND PROUD!! Sussex need 251 to beat Lancashire at Hove. Luke Procter is the last man out, making 22 before falling to Steve Magoffin. Is there enough time for Sussex to force a victory, and further dent Lancashire's survival hopes? Live BBC radio commentary of all today's ongoing matches can be found via the Live Coverage tab. Still plenty of very happy Yorkshire fans out there. Nathan Vickers: Congratulations @Yorkshireccc! Restored some pride and positivity after the England sides recent woes. A breathless start after lunch, with wickets galore falling all over the country. But Middlesex are hanging on grimly against Durham at Lord's - they have added another 46 to their lunchtime score without any further losses. At 185-7, they need another 211 to win. What a moment it was as Nottinghamshire lost five wickets in 67 minutes. They were destroyed by their former bowler Ryan Sidebottom, who took four wickets for six runs this morning, finishing with figures of 6-30 as Notts crumbled. They were eventually bowled out for 177 to provide a Yorkshire win by an innings and 152 runs. Martyn Moxon, Yorkshire's director of cricket, described their title success at Trent Bridge as the "greatest moment in my cricket career". Yorkshire are the champions and worthy winners of the 2014 title. Could champagne corks be popping at New Road later this afternoon? A remarkable collapse by Surrey, who have lost three wickets for five runs in 16 balls, and suddenly Worcestershire are five wickets from winning promotion to Division One. The dangerous Jason Roy is out for five, caught and bowled by Moeen Ali for five. Still 81 to win for the visitors. Chris Jordan clean bowls England team-mate James Anderson for his fourth wicket of the innings. Anderson, the "Burnley Lara", made 20 from 21 balls. Lancashire lead Sussex by 244 runs with one wicket remaining. Tom Smith, who earlier retired hurt, is back out there batting with a runner. BBC Sport's Ged Scott at New Road: Surrey skipper Gary Wilson is bowled by Jack Shantry as the in-form left armer strikes in successive overs. Still 86 needed and only six wickets in hand. "Jason Roy is next in, to be followed by two more former Worcestershire players - Gareth Batty and Aneesh Kapil. "After a muted morning at New Road, the doom-laden home fans have suddenly perked up, sensing this game is not lost after all." BBC Sport's Ged Scott at New Road: Surely Worcestershire cannot pull this one round after all and win promotion today? A win for Worcestershire would do it, but still lots of work left to do. "Many congratulations to Yorkshire, worthy winners of the LV= County Championship. "It was terrific to see Ryan Sidebottom, in particular, in such splendid form. Reviving memories of his glory years with Nottinghamshire, he was irresistible on the final morning to spearhead his side's charge to the title. "Notts may have run out of steam in recent weeks but it's certainly no disgrace to lose to this Tykes team - the battle though is now on for the minor places." BBC WM 95.6's Mike Taylor at Edgbaston: "Warwickshire's momentum, steadily building over the last couple of months, now makes them favourites to finish runners-up to Yorkshire in the Championship, in addition to their limited-overs exploits. "The match finished in fairly light-hearted fashion. After Ben Duckett had delayed the Bears with some crafted strokes, especially through the offside, the lower order slogged merrily to the end. "The fixtures have fallen favourably for the Bears, giving them a clear week to prepare for their Lord's final, before returning here for the final Championship match against Durham. If they win it they'll be assured of second place, though other results could confirm that even before then." The slightest hope for Worcestershire as Surrey's Steven Davies is dismissed for 14, Jack Shantry the successful bowler. However, with only 86 runs required for victory and seven wickets remaining, Surrey appear to have this one well in hand. Leicestershire strike immediately after lunch as Charlie Shreck has Ian Cockbain caught behind for 15, leaving the home side 143-6 in their second innings and 224 runs ahead. BBC Radio Leeds' Dave Callaghan: Many thanks to my fellow BBC commentators for their kind words today. So proud to work with such a great set of people. listen to the moment Ryan Sidebottom took the final Notts wicket to clinch the county title for Yorkshire. White Rose fans - it is 54 seconds of commentary that you will never tire of hearing. It has been quite a year for these two young batsmen. 13-year wait to be crowned county champions. Mark in Yorkshire: Just thanked my wife for the best wedding anniversary pressie ever. 33 years today and she arranges for Yorkshire to be crowned county champions. Thanks Kath. Thanks, Phil. Go and have a lie down. claim the Division One title. Congratulations to all concerned. And well done, too, to Warwickshire. The Bears are up to second in Division One following their innings win over Northants at Edgbaston. We will hopefully have some reaction from Trent Bridge shortly, and there are still four matches ongoing. While there remains the prospect of results in those games, we shall continue with our live text commentary. Hasn't that been an exciting morning? Well, for everyone except Nottinghamshire fans... And there's still much more to come in both the relegation and promotion battles. While Yorkshire are no doubt having a few beverages unsuitable for children, I can do without all that kerfuffle and think I might grab myself a cheese toastie. That leaves me to hand over to another Phil, Phil Cartwright that is, who will guide you through the next session, which will no doubt contain more thrills and spills. BBC Sussex's Adrian Harms: "Having endured an initial onslaught from Jos Buttler and Steven Croft, where 90 runs came in the first hour, Sussex pegged the visitors back, taking four wickets as Lancashire reached lunch on 328-8, a lead of 214. "Lancashire will have half an eye on events at Lord's. If Middlesex lose and Lancashire win, Glen Chapple's side will move out of the relegation zone. If Sussex win they are definitely safe in Division One next season. It's all to play for!" BBC Radio Manchester's Scott Read: "Lancashire get to lunch in the knowledge that a win this afternoon will almost certainly take them out of the relegation zone. "Losing quick wickets before lunch may not have been the worst thing for Lancashire, as they will need time to bowl Sussex out. "Tom Smith retiring hurt has not helped their bowling cause, but if the Red Rose are to win, it will be largely down to James Anderson, Glen Chapple and spinner Simon Kerrigan." Warwickshire have just taken a massive step towards claiming second spot in Division One, after Keith Barker takes his eighth wicket of their match against Northants to see them to an innings victory at Edgbaston. Neil Wagner is the last man to fall, caught by Jonathan Trott, whose 360-run partnership with Sam Hain helped Warwickshire to a massive 573-9 declared. The victory moves the Bears above Nottinghamshire into second, 15 points ahead of the Trent Bridge outfit, who will be further dejected by the news from Birmingham. BBC Look North's Harry Gration: Fantastic news from Trent Bridge. Champions again. Well done Andrew Gale, a top captain and a team to be proud of. Yorkshire captain Andrew Gale may have been suspended for the game at Trent Bridge, but he has been out and, in his words, done a "John Terry". He was out celebrating on the pitch with his team-mates shortly after they clinched a first Championship title since 2001. Yorkshire fans - how will you be celebrating your county's victory? Will there be parties from Northallerton to Sheffield and Rotherham to Keighley? #bbccricket, by emailing tms@bbc.co.uk or by texting 81111, remembering your name with your message. BBC Radio Leicester's Richard Rae: "Could it? Might it? Will this be the day that Leicestershire win their first County Championship match for two years? And after Gloucestershire scored 646 in their first innings? "As daft as it sounds, it could happen. The Foxes have picked up five Gloucestershire wickets in the morning session here at Bristol, meaning the home side lead by 224 with five wickets remaining and up to 68 overs left in the day. "With the pitch still playing well, a draw is still the likeliest result, but a target of around 290 in 55 overs could make proceedings very interesting indeed." BBC Sport's Ged Scott: "Surrey go into lunch at 122-2, with Zafar Ansari and Steve Davies on 46 and six respectively. "Vikram Solanki reached a half century on his first return to New Road since leaving Worcestershire at the end of the 2012 season. It was a first 50 for Solanki back at Worcester since May 2012 (for the home side against Somerset) when he went on to reach three figures. He looked assured but played on to Charlie Morris for 58." BBC London 94.9's Mark Church: "A good morning for Surrey. Starting the day needing a further 187 for victory, Vikram Solanki and Zafar Ansari played very well. Solanki's excellent fifty came from 97 balls before Charlie Morris broke the century partnership between him and Ansari. Surrey need 95 runs to win while Worcestershire require eight wickets to guarantee promotion." BBC London 94.9's Kevin Hand: "Last year's champions Durham are on the verge of the victory that will ensure their Division One status. "They picked up Dawid Malan with the last ball before lunch to leave the hosts 139-7, having been set 396 to win. "Six wickets have fallen this morning and Middlesex will now be looking nervously over their shoulders with two games to play, the last being at second-bottom Lancashire." The end seems nigh at Edgbaston, after Warwickshire's Keith Barker gets the ninth Northants wicket to fall, bowling Andrew Hall for 31. Northants hopes rest with numbers 10 and 11 Neil Wagner and Muhammad Azharullah as they stare an innings defeat in the face, still trailing by 36 runs. A wicket just before lunch at Nevil Road and it's Gloucestershire's Hamish Marshall who has become Ollie Freckingham's sixth victim of the match. With the hosts only having five wickets left and a lead of 224, if Leicestershire skittle the last few over quickly after lunch, we could have a game on. Two wickets in quick succession for Durham skipper Paul Collingwood, who strikes with the final ball before lunch to trap Dawid Malan lbw for 46. Middlesex are 139-7 and that victory target of 396 seems a long way off. Turns out there are proud Yorkshire folk all over the place today. Dave Eastwood: Yorkshireman here at the hospital canteen in Durham and just found out the news (plus it's fish and chips Friday!) great day! Hope the fish and chips taste even better after today, Dave. Save some for me please. Paul Milner: Yorkshireman in Switzerland proud of players back home! Ryan Sidebottom ended with nine wickets for the match. BBC Radio Northampton's Chris Egerton at Edgbaston: "As Yorkshire get stuck into the champagne at Trent Bridge, Warwickshire are ready to take over from Nottinghamshire in second place. "Ben Duckett has just gone for 71 - caught behind off Oliver Hannon-Dalby, a former Yorkshire player, as bottom club Northants slide to 239-8. They are still 61 runs away from making Warwickshire bat again. "A win for Warwickshire will put them 15 points clear of Notts with one game remaining - and it makes a difference in terms of prize money, at over £100,000. "One bright spot for Northants is the form of 19-year-old Duckett in the last two weeks. He made his maiden first-class century last week against Somerset and has followed it up with two half centuries in this game." Durham are closing in on victory at Lord's - Middlesex are 126-6 needing another 270 runs to win. Paul Collingwood's medium-pace trundlers have accounted for Paul Stirling, who is out for 15. In the Division Two promotion battle at New Road, Surrey are well placed to beat Worcestrershire at New Road but they have just lost Vikram Solanki for 58, bowled by Charlie Morris. Chasing 217 to win, Surrey are 106-2. Two quick wickets for Sussex have put them in the box seat against Lancashire at Hove. Almost as soon as Glen Chapple walks out of the pavilion to replace the hurt Tom Smith, he walks back in after being caught by the sub fielder off Chris Jordan. And Simon Kerrigan soon follows soon for a fourth-ball duck - caught by Michael Yardy off Lewis Hatchett. Lancashire now lead by 207 runs with two wickets remaining - could be a tight finish there. Lancashire, who now have a lead of 205 over Sussex at Hove, have lost Tom Smith for the moment. He has had to retire hurt on 18 with a back problem, bringing 40-year-old captain Glen Chapple to the crease. Warwickshire look like they're heading to victory now at Edgbaston against relegated Northants with the wicket of Ben Duckett for 71. Former Yorkshire bowler Oliver Hannon-Dalby has the Northants man caught behind, and leaves the visitors hoping their tail will wag for the rest of the day. They still need 61 runs to avoid an innings defeat with two wickets left. Mark Simpson: Sunny day here in Germany. Sunnier still now that Yorkshire are crowned champions!!! So it may be all over at Trent Bridge, but there are still five more matches in play and lots to be decided. We will be sticking around to guide you through all the action. BBC Sport's Ged Scott at New Road: "Surrey are taking it very steadily in their pursuit of a 217-run victory target. "Former Worcestershire skipper Vikram Solanki, dropped in the final overs on Thursday evening, has moved his overnight score on from 21 to 38. "Zafar Ansari - on just three from 37 balls when he resumed - has perked up a little to move onto 25, having survived an lbw shout from Mitchell McClenaghan in the day's first over." Huge wicket at Lord's in terms of the Division One relegation battle. Durham's Peter Chase has trapped John Simpson lbw for eight and Middlesex have lost their last three wickets for just 22 runs, leaving them struggling to avoid a heavy defeat. The hosts need 396 to win. A proud day for all involved with Yorkshire, as stand-in captain Joe Root lifts the trophy with his team-mates popping champagne around him. Yorkshire president Dickie Bird and head coach Jason Gillespie look on as their players tip the champers in the trophy. Alcohol before midday? Well, I guess this is something a little bit special. Oli in London: Fantastic work from Yorkshire, despite losing players to England they have managed to perform brilliantly all season. YCCC vs The Best of the Rest?? I think YCCC might win! Ron: Used to be said a strong England needs a strong Yorkshire. White Rose too good for rest of Championship, come on, let's celebrate the success of youth in Yorkshire! No name: Tour de France, County Championship, Brownlees, Ennis, Adams, Armistead... forget independent Scotland, Yorkshire would be an international powerhouse! It doesn't get any better for Nottinghamshire fans, does it? Warwickshire, their closest rivals for second place, have just taken another Northants wicket at Edgbaston, as David Willey has gone for just one. Jeetan Patel, who signed a new contract yesterday, has seen Willey caught by Keith Barker. Despite some late hitting from Andrew Hall, the visitors still trail Warwickshire by 80 runs with three wickets left in their second innings. Some very proud Yorkshire fans out there today. Neil in Sheffield: Awesome performance by Yorkshire, we have a set up to be proud of. A perfect blend of youth, experience and a fine crop of current/past/future England internationals. Chris: Brilliant. Despite losing Root, Ballance, Bairstow, Bresnan and Plunkett to England, the squad depth this season has been awesome. Heading to the pub. Harry in Sheffield: The old adage - a strong Yorkshire is a strong England. #Yorkshire CCC champions! Use #bbccricket on Twitter, or if you are not au fait with social media, you can email tms@bbc.co.uk or text 81111 with your name and message. Former Yorkshire and England opener Geoffrey Boycott: Congratulations @Yorkshireccc - the best side always wins in the end! @lythy09 for England. We'll go back to Trent Bridge in a moment, but we have another wicket to tell you about at Sussex, and it's a big one. Lancashire's Steven Croft has gone for 87, caught at mid-on by Lewis Hatchett off the bowling of Chris Jordan. The Red Rose are now 305-6, a lead of 191, as they look to avoid the drop and prevent any further celebrations in Yorkshire. Looking at the celebrations again, all of the Yorkshire players surround Ryan Sidebottom as soon as the wicket falls. They all know he has been the architect of this superb victory - by an innings and 152 runs - with phenomenal figures of 6-30 in the second innings, and 9-65 in the match. Read the match report from Trent Bridge here. "An hour and seven minutes of ruthless cricket this morning from the best team in the County Championship this season. Nottinghamshire have been outclassed and Yorkshire have brought the title home for first time in 13 years. "It's been a fantastic effort from Ryan Sidebottom as he leads the players off. You can't account for class and he has done this in style. The fans know what a special moment this is - it's a moment to treasure." Durham's Chris Rushworth claims his third wicket of the morning as he bowls Neil Dexter for four, leaving Middlesex in trouble on 83-4 in their pursuit of 396 to win. ended their 13-year wait for a Championship title! Ryan Sidebottom, the man who has led this Yorkshire team all morning, fittingly gets the final wicket when James Taylor loops one to substitute fielder Rich Pyrah - on for the injured Gary Ballance - in the gully for 75. The cheers erupt at Trent Bridge and the Yorkshire team celebrate wildly on the pitch. No name: Like most Yorkshiremen I'm a bit of an Aussie basher but what a fantastic job Jason Gillespie has done for Yorkshire. No name: Why is Lyth not being selected for England??? He bats, bowls, fields well. He has it all! Come on selectors....! Jonny in Halifax: England recall for Sidebottom now? We're going to have no players left next season. On a serious note I genuinely believe this Yorkshire side would give England a tough game! Use #bbccricket on Twitter, email tms@bbc.co.uk or text 81111 - please remember to pop your name on! One more wicket needed for Yorkshire to clinch the title. The Ryan Sidebottom show is interrupted by Adil Rashid, who traps Jake Ball lbw without scoring. James Taylor (75 not out) an Harry Gurney, who has a first-class average of five, are all that stand in Yorkshire's way. Alex Gidman cannot repeat his heroics from the first innings, where he made a career-best 264, and has been caught by Jigar Naik off Rob Taylor. Gloucestershire are 89-4, a lead of 170 runs. Plenty of praise for Ryan Sidebottom on Twitter, who has taken all three wickets to fall at Trent Bridge this morning as Yorkshire close in on the Division One title. James F. Stark: @RyanSidebottom bringing it home for the White Rose! Come on, @Yorkshireccc! Ben Thapa: What more does Taylor have to do to get into a promising but flaky England side? Every time I watch him he gets big runs. Durham seamer Chris Rushworth has his second wicket of the morning at Lord's, taking what may be a key wicket in England limited-overs player Eoin Morgan for just 21. Middlesex now sit on 79-3, still needing 317 more to win. Will they push for the victory or try and force the draw? Ryan Sidebottom's figures make particularly pleasant reading if you're a Yorkshire fan. The 36-year-old, trying to win his fourth Championship title, has figures of 3-6 from his six overs this morning. Not bad at all. England recall? BBC Sport's Isabelle Duncan at Hove: "Ashar Zaidi is off the pitch after bring walloped on the finger on his left hand by Jos Buttler. "Buttler has certainly been getting on with it. Two massive sixes have landed on the roof of our commentary box. Where's our bunker? "Chris Nash has had to take over from Zaidi with his offies and Buttler has launched him on to the media roof. Sussex have hit back though, with a heroic catch in the deep by Chris Jordan ending a selfless innings by Buttler - a man with a mission." Big breakthrough for Sussex at Hove as England wicketkeeper Jos Buttler is dismissed for 33. Buttler's England team-mate Chris Jordan takes the catch off the bowling of Lewis Hatchett and Lancashire are 277-5, leading by 163 runs. I think I may have put the kiss of death on Luke Fletcher, but Ryan Sidebottom has been bowling absolutely superbly throughout this whole match and has his fifth wicket of the innings. Fletcher's 19-ball stint ends when he edges the left-arm seamer to Adam Lyth at second slip. Two wickets to go. This could all be over very, very soon. Someone get the kettle boiling. Injured Yorkshire bowler Liam Plunkett credits coach Jason Gillespie with getting his international career back on track. "He made me feel like a good cricketer," he told BBC Radio Leeds. "That's one of those things, having a coach's backing, that's so important for a player. He made me believe in myself and that's what's made me better over the past year." James Taylor is doing his best to save some of Nottinghamshire's blushes with a steady 71 from 141 balls so far. He and Luke Fletcher will want to stay together until at least lunch to give their side any chance of staying in the game. A couple of wickets elsewhere to tell you about. Warwickshire look to be keeping the pressure up on Notts in what has now become the battle for second place, with Keith Barker taking the wicket of Northants' James Middlebrook for 27. Already-relegated Northants still trail Warwickshire's first innings total by 117, and look set for an innings defeat. Meanwhile in Bristol, Gareth Roderick - who made 171 in Gloucestershire's first innings - is out for 21 and the hosts are stuttering at 53-3. Their match with Leicestershire looked certain to peter out to a draw - do the visitors, who haven't won in the Championship since September 2012, have other ideas? Plenty of smiling faces in the Yorkshire camp this morning, including one from this man. Head coach Jason Gillespie, who has only lost three Championship games since taking over the White Rose county, will be delighted by the start his side have made at Trent Bridge and will be hoping his side can enjoy a champagne lunch. Or whatever they have to celebrate in Yorkshire. Maybe a cuppa or some ale? Liam Plunkett: Loving @RyanSidebottom this morning. That is one phenomenal beard. Well done, Liam. BBC Sussex's Adrian Harms at Hove: "There's no need for floodlights here - it's a glorious day for the last first-class action of the season at the County Ground. Jos Buttler is already in the groove, twice hitting Ashar Zaidi for six." After facing just eight deliveries, Nottinghamshire captain Chris Read, who impressed so much in the first innings, is the latest victim for Ryan Sidebottom. The ball seemed to nip away from Read and he feathered a catch to wicketkeeper Jonny Bairstow. Surely it's only a matter of time before Yorkshire wrap this one up with the tail to come. Yorkshire only have four wickets left to get, but they may have to do it without Gary Ballance. The England Test batsman is currently off the field after injuring his hand trying to take a catch in the slips. Rich Pyrah is the man to replace him. Early wicket at Nevil Road and it comes in the form of Will Tavare. The Gloucestershire man, who has impressed in his maiden season in the first-team this term, has been caught by Tom Smith of Leicestershire off the bowling of Charlie Shreck for four off 41 balls. Notts nightwatchman Gary Keedy has only lasted until the third over of the day and Ryan Sidebottom has his sixth wicket of the match. The evergreen former England left-arm seamer takes the off stump of Keedy, three years his senior, and the batsman failed to get off the mark from his 29 balls. Chris Read, who was left stranded on 81 in their first innings yesterday, is the next man in. No name: Good to see Yorkshire on top, hope they wrap it up today. Pleased for el presidente Dickie Bird. Use #bbccricket on Twitter, email tms@bbc.co.uk or text 81111- don't forget to put your name on them! The first wicket of the day has fallen and it comes at Lord's, where England Test batsman Sam Robson - not given a central contract by the ECB yesterday - has gone. The Middlesex opener has fallen to Durham's Chris Rushworth for 38 from only the fifth ball of the day. Middlesex still need 348 runs for victory in the battle of the Division One strugglers. Nottinghamshire nightwatchman Gary Keedy has seen off the first over from Yorkshire seamer Ryan Sidebottom, hoping to take advantage of the overcast conditions, with relative ease. "It's a little more cloudy and overcast today, which Yorkshire supporters will think is absolutely fine with Ryan Sidebottom in the side. "This could be a special day for Yorkshire fans, ending their 13-year wait for the Championship title. The final days are always the special tingly sort of days. A lot of people invest time and emotion into following their counties, which doesn't get the same attention international cricket does. "This is a very special day for many people and there will be many listening today who are nervous, even though Yorkshire are in a strong position. "Nottinghamshire are pretty upset about the nature of Samit Patel's stumping yesterday. That, and the fact that they were second in the table last week, has rounded off a disappointing week." "It will be the fourth time he has played in a Championship-winning side. I know how he feels. I played in 1959 when we won the Championship. It is a wonderful, wonderful feeling. "He has done a tremendous job for us. He is still bowling very well. It is just amazing how he keeps going. He has done a wonderful job. Everybody is so chuffed. It is 13 years since we last won it, so it is not before time because Yorkshire is the most powerful cricket team in the world and probably the best club in the world." Bird will be hoping Sidebottom can continue his form - he will bowl the first over of the day. Before the start of play, Barnsley's very own Dickie Bird, the Yorkshire president, spoke to BBC Radio 5 live about the county's title hopes. "It is just amazing," said the former Test umpire. "I feel very emotional. I feel so very pleased that in my first term as president we are going to win the County Championship. It is the first time since 2001 so it is a wonderful achievement. It has been a wonderful, team effort from the office staff, the coaches and the players. "We have some magnificent players who have come through the academy. We have five players now ready to go into the England side. [Head coach] Jason Gillespie has done a tremendous job. He has turned the club around. We have got some wonderful players. He has instilled the Australian attitude into these players, how to win, the will to win. He has instilled mental strength into them. It is amazing." The bell has rung at Trent Bridge and the players are making their way to the middle. Yorkshire are just five wickets away from ending 13 years of hurt. Listen to live ball-by-ball commentary of Nottinghamshire v Yorkshire on BBC Radio 5 live sports extra, BBC Radio Nottingham and BBC Radio Leeds. BBC London 94.9's Kevin Hand: "Durham are the clear favourites going into the final day and will hope for the early wickets that we have seen in every morning session so far. The pitch, however, is true and Middlesex, who chased 472 against Yorkshire here in early-season conditions, will feel that if they can reach lunch no more than three wickets down, they will have a chance." BBC Newcastle's Martin Emmerson: "Durham have set Middlesex a large target and you would imagine they have a great chance of winning this one to seal only their second victory on the ground. Although Middlesex chased down 472 to beat Yorkshire earlier this season, that was on a new wicket and, as this is the last Championship match here this season, the pitch looks well worn." BBC Sussex's Adrian Harms: "Ashar Zaidi has spent much of the season playing second XI and club cricket, and probably wouldn't have played in this game had James Tredwell not returned to Kent from his loan spell. He has more than justified his selection. Lancashire need to get their sums right tomorrow, setting Sussex an achievable target whilst allowing enough time to bowl the hosts out is not an easy equation, but it should set up an intriguing final day." BBC Radio Lancashire's Scott Read: "Thanks to some skilful batting from Steven Croft and Ashwell Prince, Lancashire still have a chance of winning the game. Jos Buttler is now at the crease and, alongside Croft, they have to ability to score quickly. But I wouldn't expect to Lancashire to go gung-ho." BBC Coventry & Warwickshire's Clive Eakin: "Warwickshire would like to have won this game inside three days but, with plenty of time off ahead of their Lord's final on 20 September, they will not be too worried about having to come back on the final day to wrap up victory. "Northants have shown commendable professionalism in sticking to their task in a seemingly hopeless cause, but with Jeetan Patel looking threatening and a new ball available later if necessary, a win should be little more than a formality. "Such a victory would leave the Bears favourites to finish second in the table - a fine achievement in an excellent season for them." BBC Sussex's Adrian Harms: Perfect day for the last cricket action of the summer at Hove. Full commentary on @BBCSussexSport. BBC local radio have provided ball-by-ball commentary of every Championship match in 2014, and this week is no different. While they fight to stay in Division One, the race to replace one of them in the top flight is coming along nicely. Division Two leaders Worcestershire had looked on dodgy ground against fellow promotion hopefuls Surrey before a maiden first-class century from Jack Shantry (pictured) took his side's lead to over 200 runs. But a man who knows the New Road ground well is former Pears captain Vikram Solanki, who will be out to bat as his side need another 187 runs with nine wickets in hand. But don't think we'll just be focusing on events at Trent Bridge. The battle to avoid relegation from Division One is heating up, with second-from-bottom Lancashire grateful for Ashwell Prince's half century against Sussex yesterday which has brought them back into the match. The Red Rose, drawing motivation from their fierce rivals edging towards the title, resume 89 ahead with six wickets left, while in the other battle of the strugglers Middlesex need another 352 runs to beat Durham, with nine wickets still to tumble. Will Yorkshire have enough to skittle out the final Notts wickets before the close of play? And will they be deserved champions? We are keen to hear your views, so why not get involved? tms@bbc.co.uk or text 81111 with your name and message. "Day four looks like being cooler and cloudier as Yorkshire look to pick up the five wickets they need to secure the Division One title. "Nottinghamshire will have other ideas though, beginning on 149-5 in their second innings, with an in-form James Taylor unbeaten on 59 and Chris Read, who made 81 not out in the first innings, still to come. "The home side will be looking to extend the contest for as long as possible but they are still 180 runs away from making Yorkshire bat again. "It is safe to say the travelling support will again be huge - and the champagne has already been put on ice." In the absence of suspended captain Andrew Gale, Joe Root is captaining Yorkshire at Trent Bridge. Speaking at the end of the third day's play, England batsman Root told BBC Look North: "It was a good day. "We set out at the start of the day saying if we can get 10 wickets, we'd have had an unbelievable day. To get 11 was fantastic. "We know there's a lot of hard work to go. It's a very unresponsive pitch and to get to the position we are now is testament to how well the guys have performed." The main talking point will, of course, be whether Yorkshire can wrap up their first Championship title since 2001 with victory against Nottinghamshire at Trent Bridge. The White Rose, helped by the stunning bowling form of Ryan Sidebottom, Jack Brooks and Adil Rashid, need just five more wickets to wrap up an innings win - with Notts still trailing by 180. Notts will be hoping their tail can keep on wagging for the whole of Friday, as they look to fend off Warwickshire and hold on to second place in the Division One table. Good morning and welcome to our live text coverage of the final day of this round of County Championship matches. Phil Shepka will be your guide for the morning session. The weather is set fair for most of the country, so let's hope we see some excellent cricket in the autumn sun.